While I do not have time myself to plan an end of the school year party this year, I do hope to do something special on the last day of school. All 3 of my kids are moving up to a new school in the fall. Its an end of an era for all of them, which I feel should be acknowledged. 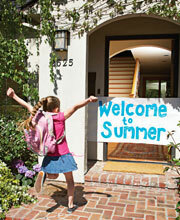 I really like this Welcome to Summer banner idea I saw on Family Fun. It's a fun and easy way to welcome in the summer. Pillsbury.com has some fun and easy end of school recipes to try including one for a crescent dog on a stick. 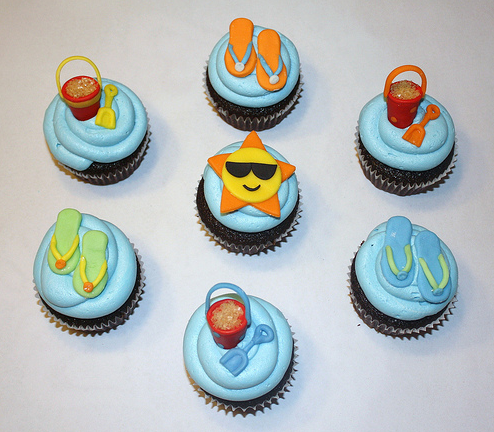 How about some summer themed cupcakes from The Cupcake Blog . One thing we have done in years past is go to the local Dairy Queen the last day of school. You could also buy a few containters of ice cream and several toppings and invite your childrens friend over for a sundae party. Whatever you decide to do, there are many way to say.. WELCOME SUMMER!